All NEW! These dinosaur "complete the picture" puzzles can be quite tricky - because drawing dinosaurs can be quite tricky! Kids need to fill in the missing parts of the grid by looking at the complete picture below. Get the kids to test their drawing skills by filling in the missing areas on our complete the allosaurus puzzle. They'll need good observation skills too! Can the kids complete this picture of a diplodocus? Use the finished picture as reference and fill in the missing parts of the grid - be careful copying his long neck and tail! Here's a fun puzzle/drawing activity which will challenge the children's copying and pen control skills! Copy the missing bits of the ichthyosaurus by referring to the complete picture underneath. This fun printable is a cross between a puzzle and a drawing activity! Can the kids complete the picture of the iguanodon at the top by referring to the completed bottom picture? Practice your drawing and observation skills by completing the missing sections of our cute mammoth! Can the kids complete the first picture of the pteranodon, with reference to the second? It takes good copying skills! The idea of this spinosaurus puzzle is for the children to fill in the missing parts of the picture on top by referring to the picture on the bottom. It's a great way to practise concentration and copying skills, but fun too! 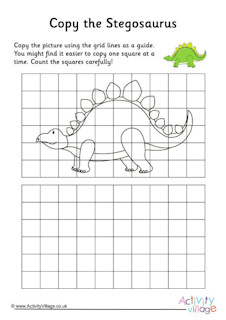 The kids will need concentration skills to copy the missing sections from the bottom image to the top on this stegosaurus complete the picture puzzle. It's a lovely picture to colour in once they've finished copying too. Can the kids complete the picture of the ticeratops? We've provided a picture underneath so they need to study it carefully to work out what's missing. They can colour in the picture once they've finished!